​​Offering superior hair salon services to the honolulu, Hawaii community since 1967. ​​What makes Lloyd Horibe's Hairscapes salon a cut above the rest? Aside from having over 50 years of professional experience, the master stylist, Lloyd Horibe, personally and meticulously trains all of our staff in-house through our unique apprenticeship program. Stylists start off as assistants for nearly two years training in precision cutting--made famous by Vidal Sassoon--to offer premium hair cuts each and every time. Lloyd has trained over 70 stylists and many have gone on to open successful salons of their own. Lloyd and his staff's skills are unmatched throughout the islands. At Hairscapes, our stylists: Myra, Mitzie, Sherry, Laurie, Adrienne, Kalei, and Lloyd, are dedicated to helping clients, regular and new, envision and execute the perfect look. We specialize in contemporary hair cutting, innovated hair styling, professional coloring and highlighting, and color correction. We also sell new, top-of-the-line hair products and appliances to support your style outside of the salon. 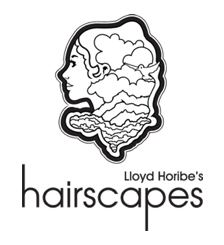 Give us a call at 808-599-4247 to schedule an appointment and experience Lloyd Horibe's Hairscapes today!